Did you know that every web page indexed by Google has a content quality score that directly influences your page rank? That’s why Milestone is passionate about creating original, fresh and engaging content that signals a quality score on every page. Every page should have a purpose, be trustworthy, offer a diversity of content, and have a functional design that allow users to easily find and focus on the website content elements. If any of these factors are considered low quality, your entire page can earn a low quality score. Body Content – Main content encompasses the fundamentals that achieve your page purpose. Your website must have a “satisfying” amount of high-quality main content for it to score and rank high. Enhanced Content – This content enhances the user experience. Supplemental content may be header/footer navigation, social buttons, articles, comments, ratings and anything that augments and personalizes the journey. Advertisements – This content is displayed to generate revenue. If the monetary-based content detracts from the main purpose of the page, it will lower its content quality score. A high quality webpage must have a clear purpose, sharing valued information, interesting opinions, products, services, images, photos, and files. Your content should also entertain or present a point of view. A quality score measures how well a page achieves its purpose, satisfies the user’s search and keeps people on the page. If your audience stays on your page, it means they are happy with your content, which signals a high quality content score. A second factor for achieving a high quality score is creating content that is relevant to the site and demonstrates a level of expertise, authority and trust (EAT). Content must be considered credible, especially on heavier subject matter, like finance or technology, or entertaining and compelling on topics like fashion, food or travel. You can help your page achieve a high quality score by linking to quality pages and having a balanced proportion of different types of content – text and hyperlinks, as well as reviews, blogs and testimonials that share life experiences. The way your webpage and content is perceived is a powerful factor on your quality score. It is important that your site has a positive reputation, incorporating reviews and opinions. 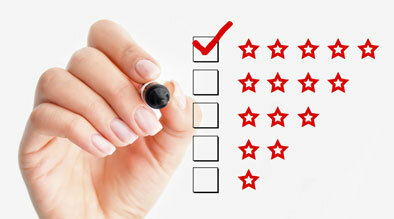 Reviews are a great indication of reputation, and the number of reviews determines how much weight they carry. One way you can protect your reputation is through honest content that you feel will not be contradicted on an independent review site. While pretty aesthetics can be alluring, your page purpose is best achieved with a functional design that has clear navigation, organized content and effective use of space and color. Your main content – the heart of your site – should be front and center, immediately visible, and in a font and size that draws people in. A clear layout and balanced use of space ensures that your body content is easily distinguishable from any enhanced features. Good functional design not only elevates the audience experience, it will impact your quality score. When creating content for a webpage, it is paramount that the words, images and features reflect the purpose of site. Your main content should give the user the information they need – descriptions, images, prices and book and buy buttons. Quality content should reflect the page focus, achieve its purpose without distraction, and be clear and easy to absorb. So what does Google consider high quality content? High quality content satisfies the consumers search desire. Your site should contain sharp navigation and the right balance of content – main, supplemental, images, and social buttons. Interactive elements that enhance the user experience will also drive quality rank. With a highly functional design and layout and original content that communicates clearly, your page will achieve its purpose and earn a high quality score. And that’s the scoop on content! Home Learn Hotel Marketing Practices to Deliver Traffic and Revenue [Educational Session]	Penguin 3.0 Finally Arrives, Is it Time to Change your Hotel Marketing Strategy?